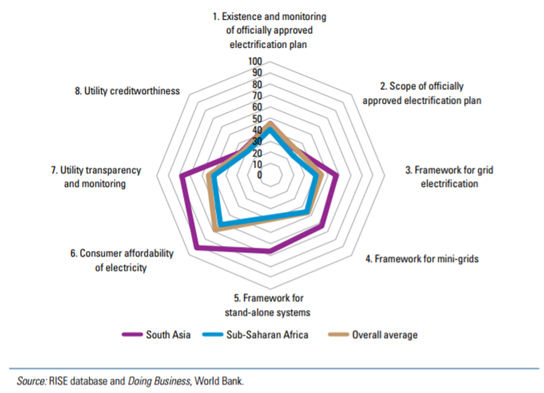 Measurements of Energy Access: A better way? ✔ Clear and simple. This standard is easy to understand and communicate. ✔ Universality. IEA estimates are available for nearly all countries. ✖ Limited information. A binary 0-1 only reports the share of people crossing an arbitrary consumption threshold. It says nothing about energy use above or below the line. ✖ Too low. The IEA currently defines “modern energy access” as annual consumption above just 100 kWh per person per year in urban areas and 50 kWh in rural areas. This is only enough to power a lightbulb and charge a mobile phone. It is also roughly the energy used by an average American in less than 3 days. ✖ Only covers household consumption. Access rates do not provide any information about energy in the wider economy, such as industry and commerce where the majority of power is used. 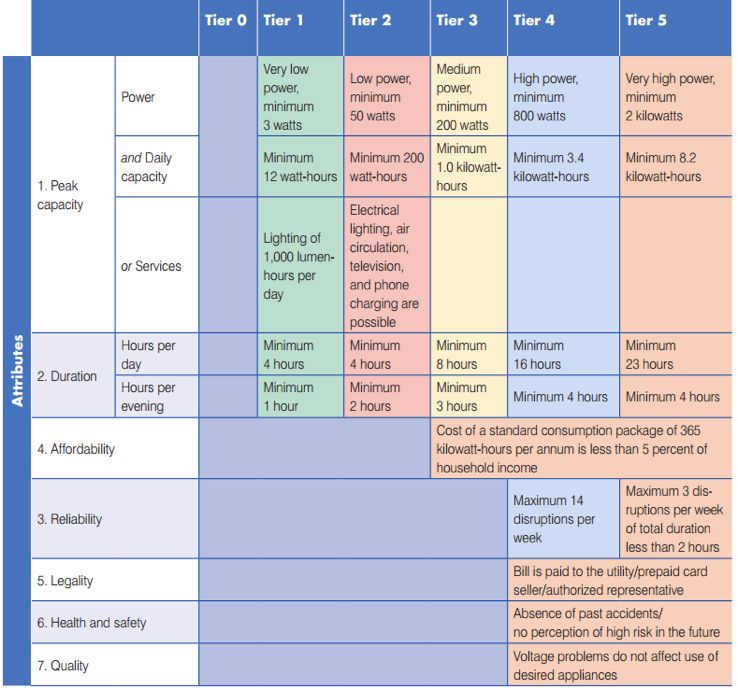 An improvement on the IEA measurement is the multi-tier framework (MTF) from the World Bank and UN’s Sustainable Energy for All (see Figure 1). ✔ Multiple tiers. The MTF has five tiers, implying an energy ladder rather than a single step. ✔ Energy quality. Reliability, duration, and affordability are included. ✔ Productive uses coming. A separate MTF is being developed to cover non-household uses. ✖ Range is still low. The highest tier is equivalent to just 600 kWh, which is still low by global standards. ✖ Data availability. Data is only recently being collected as a pilot. 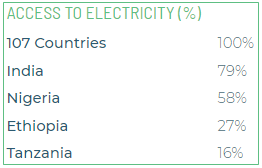 Electricity generation per capita is another useful measure of energy. Reported by the World Bank, this divides an estimate of total national generation by the population. ✔ Includes electricity for all sectors, including households, industry, and commerce. ✔ Highly correlated with development. Nearly all high-income countries consume at least 5,000 kWh/capita (Figure 2). ✖ No information on inequality or in the distribution of consumption. ✖ Only covers electricity generated for national utilities. Better measures? A working group of the Center for Global Development in Washington DC proposed. Collecting data on household energy consumption at multiple levels, such as 100 kWh (extreme energy poverty), 300 kWh (basic access) and 1,500 kWh (modern access). Create country-level energy groups. 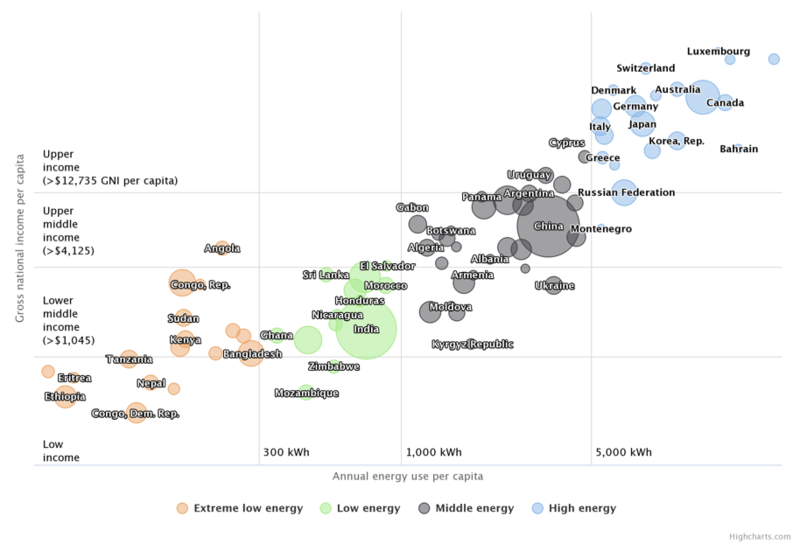 As with income, categorize countries by Extreme low energy (< 300 kWh/capita/year), Low (300–1,000), Mid (1,000–5,000 kWh), High (more than 5,000 kWh). Better data and estimates. Greater investment in energy data could exploit new technologies such as satellite imagery, remote sensors, geocoded household surveys, and low-cost mobile phone polling. More Than a Lightbulb, Energy Access Working Group, Center for Global Development, 2016. The World Bank’s Regulatory Indicators for Sustainable Energy (RISE) is a set of indicators intended “to help compare national policy and regulatory frameworks for sustainable energy.” Morgan Bazilian discusses key takeaways.